What does the Pioneer FE do? The Pioneer FE Surface Plasmon Resonance (SPR) system is a highly sensitive, label-free instrument for the measurement of real-time binding interactions. It can be used to measure affinity and kinetics of small molecules, peptides, fragments, proteins, nucleic acids, antibodies and other biomolecules. 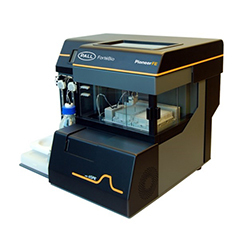 The Pioneer FE system has the unique OneStep feature that can calculate Kd from a single injection of an automatic concentration gradient. The system can run a binding affinity screen of up to 768 analytes in 24 hours and is ideal for fragment based drug screening. It has numerous applications for a wide variety of projects. What is Surface Plasmon Resonance (SPR)? 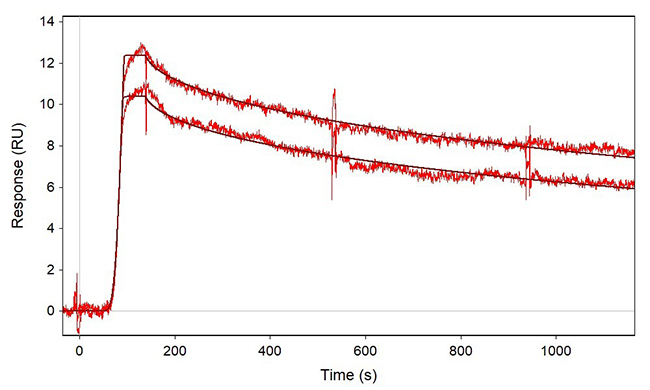 SPR is a label-free biophysical technique that can be used to measure affinity and kinetics of biomolecular interactions in real-time. In principle, a metal biosensor film (gold) is set between a buffer-prism interface and is coated with a variety of biological molecules. At the correct incidence angle from a polarized light source, the energy of the photon is absorbed by oscillating surface electrons, thus producing a minima in the intensity of reflected light. As binding takes place at the gold film, this SPR minima is shifted and can be accurately measured versus time. This phenomenon can be applied to the study of intermolecular interactions and binding kinetics. 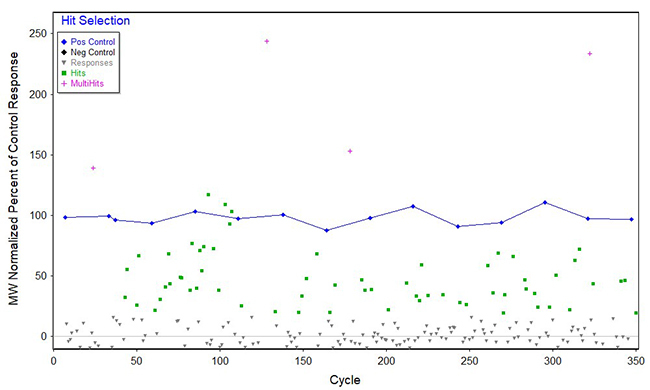 Binding Affinity Analysis and Characterization – This is an example of a SPR sensogram obtained from a high affinity (pM) binding interaction. Note, binding affinity (KD), as well as kinetics parameters (Ka and Kd) can be accurately measured. Small Molecule and Fragment Screening – This is an example of a fragment screen identifying multiple hits in relation to the positive control. Note: even weak binders (µM to mM) can be identified by SPR.